It was the end of an era at the Bruce Hill stable last week, as Tegan Harrison completed what has been an outstanding apprenticeship. Tegan started with the Hill stable in late 2011 and through hard work and dedication she has become one of the country’s best young riders. She started from the bottom, riding at the non - TAB meetings all around the state, and she has continued to improve and climb her way to the top. In 2012 she took out the Gold Coast Apprentice title as well as the South East Queensland Provincial Apprentice of the Year award. 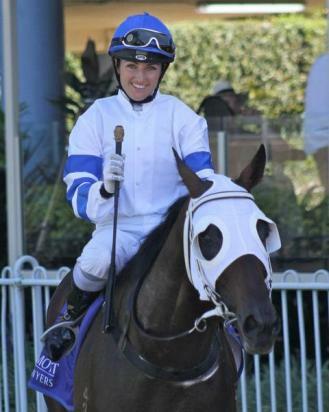 In 2103, she won the Queensland Metropolitan Apprenticeship Premiership and this year she has taken it out again, becoming the first female to win back to back titles. She outrode her claim earlier this year and despite this, she has had no trouble getting rides as she has well and truly established herself as a city class rider. She has now ridden five black type winners, including the Group Two Victory Stakes aboard Temple of Boom and the time honoured Ipswich Cup aboard Brave Ali. She was also a narrow runner up in Queensland’s biggest race, the Group One Stradbroke Handicap. Bruce and the team are extremely proud of what Tegan has achieved in such a short time, we wish her all the best as a senior rider and look forward to many more winners together in the future.